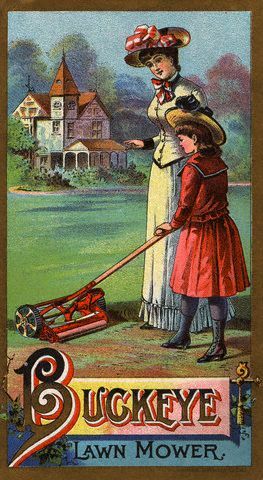 Lawn mower became essential nineteenth century garden tool. The lawn continues to be important to many homeowners. The ‘modern’ design of the English garden, as it was called in the early eighteenth century, included a lawn. The gardeners during this period used a scythe to cut the grass. Eventually the lawn mower appeared on the market, first in England, then by 1850 in America. Rochester, New York seedsman James Vick (1818-1882) sold lawn mowers in his seed catalog. Whatever a homeowner used was not as important as the goal of keeping the lawn in the home landscape trimmed. Thus the American home owner could boast of a lawn in the long tradition of the English garden.